It is impossible to study the Bible without realising that God has a special concern for the poor and disadvantaged. In Isaiah chapter 1 God tells the people that much of their religious activity is meaningless and asks them instead to care for the people who have a special need. Therefore go and make disciples of all nations, baptising them in the name of the Father and of the Son and of the Holy Spirit. Matthew 28:19 N.I.V. We believe that our work in Malawi is a proper response to the teaching of both the old and new testaments. We recognise that the greatest need of any person is to have new life through a personal relationship with Jesus Christ but we recognise also that every person is special in God’s sight and deserves to have access to the daily essentials of life so that they can live in dignity. Our involvement in Malawi seeks to reflect God’s love for his people there. Mourne Presbyterian Church Livingstonia Partnership brings help and hope to the people of Livingstonia. Your Donations Are Very Welcome. 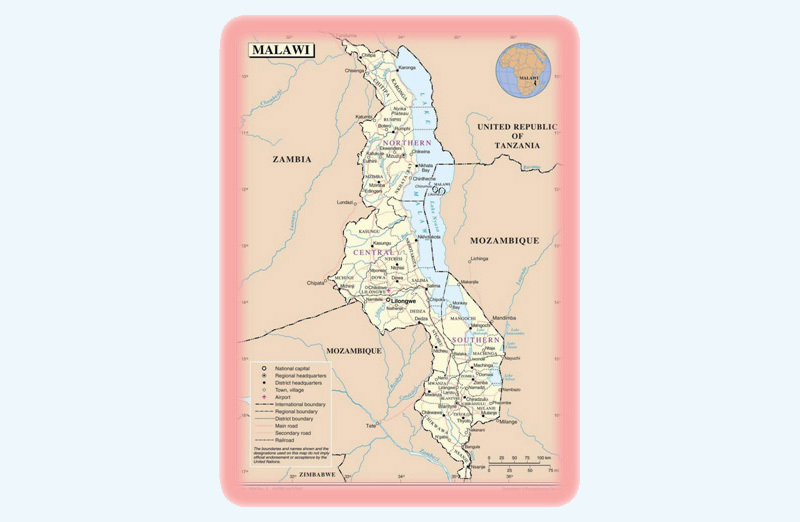 Malawi is a small landlocked country in South East Africa. It is bordered by Tanzania, Zambia and Mozambique. It is situated at the southern end of the Great Rift Valley and its main geographical feature is Lake Malawi. It has a population of approximately 13 million people many of whom are subsistence farmers. For more information about Malawi visit the website of the Malawi High Commission. For Travel Advice from the U.K. government visit the: Foreign & Commonwealth Office site and follow links to Malawi. 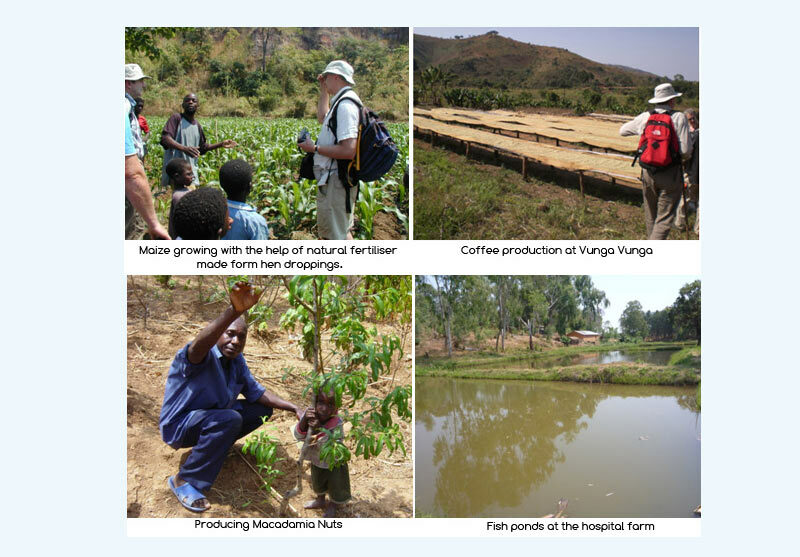 Mourne Presbyterian Church has been working in the Livingstonia area since 2002. Livingstonia, in Northern Malawi is located in a spectacular location one thousand metres above the waters of Lake Malawi on the edge of the Nyika National Park. The Mission Station at Livingstonia was founded in the late 19th century by the Scottish clergyman, educationalist and explorer, Dr Robert Laws. Although Livingstonia is named after the famous missionary and explorer, Dr David Livingstone, it is thought that he never actually visited the place. During his 52 years in Malawi, Dr Laws was responsible for building the now famous church with its beautiful stained glass window depicting Dr Livingstone. He also built a hospital, various educational establishments and many homes. Today the Livingstonia Mission is under the control of the Church of Central Africa Presbyterian (CCAP) Synod of Livingstonia which is based in Mzuzu. 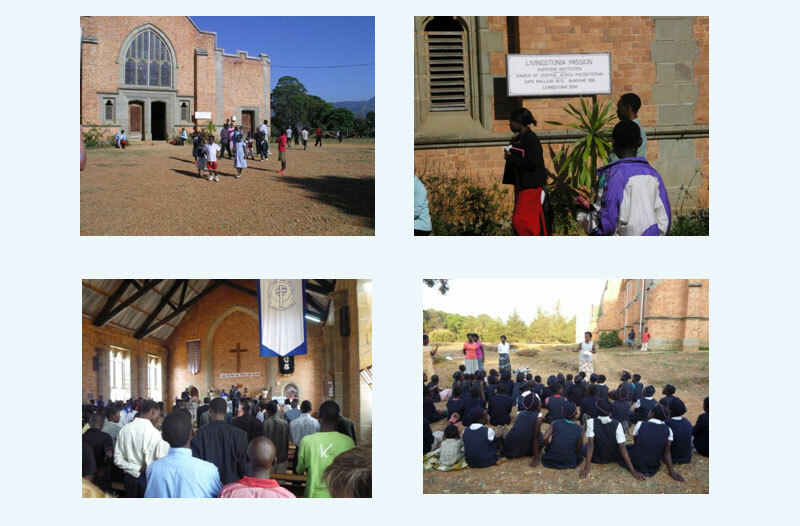 The Mission Station is now home to the church, a primary school, a secondary school, the technical college, a campus of the University of Livingstonia, an ever expanding hospital, many homes and a bustling market. The visitor to Malawi is likely to arrive at Kamuzu International Airport in the capital, Lilongwe. Five hours north, on a good quality road, is the northern city of Mzuzu which has a population of approximately 135,000 (2008). Two hours further north is the small town of Chitimba with its stalls and stores selling food and supplies to the passing traveller and local residents. Turn off to the left and you are on the famous Girode, which in fifteen kilometres, winds its way up the side of the cliff and eventually brings the traveller to Livingstonia, one thousand metres above. For the visitor who wants to avoid the multiple hairpin bends and sheer cliffs of the Girode, the back road runs for some seventy kilometres from Phwezi to Livingstonia but is almost impassable during the wet season. Whichever route is chosen the weary traveller on arrival at the Livingstonia Mission will be rewarded with stunning views of Lake Malawi and the Tanzanian mountains in the distance. Then the King will say to those on his right, Come, you who are blessed by my Father; take your inheritance, the kingdom prepared for you since the creation of the world. For I was hungry and you gave me something to eat, I was thirsty and you gave me something to drink, I was a stranger and you invited me in, I needed clothes and you clothed me, I was sick and you looked after me, I was in prison and you came to visit me. The partnership between the Livingstonia Mission and Mourne Presbyterian Church dates back to the late 1990s when funding was given for medical supplies for the David Gordon Memorial Hospital. 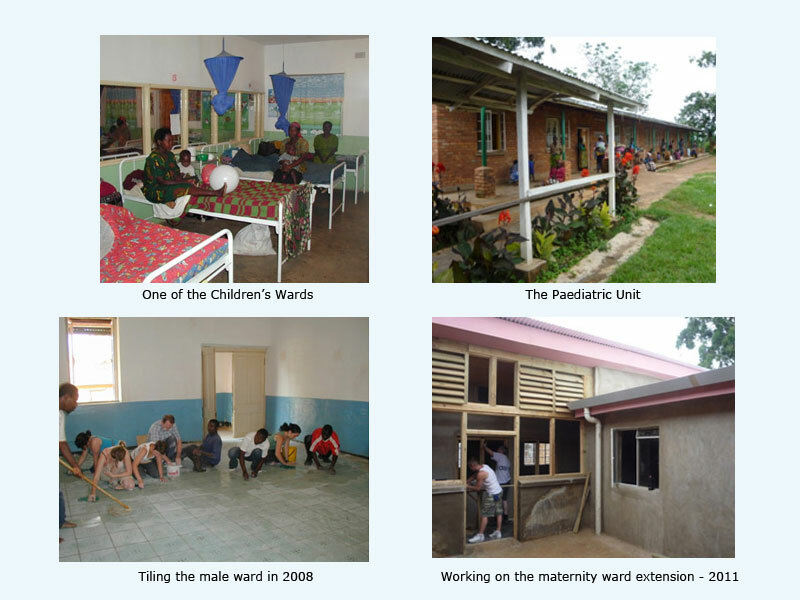 In 2001 we learned about the need for a separate facility for children at the hospital and as a result the first work party went to Livingstonia in 2002 to build a new paediatric unit. Since then the partnership has developed and today has many different aspects. The David Gordon memorial Hospital has been providing healthcare for the people of the area since 1911. Although the management and staff face many challenges the hospital continues to be a place where many needy people receive help and healing. Mourne Presbyterian Church is one of many partners who work to support the hospital. Malawi has a million children who have lost one or both parents. Many of them are taken in by grandparents who cannot afford to care for them. Others live without adults in child headed homes. The Primary Healthcare Department of the David Gordon memorial Hospital cares for many such children providing them with food, housing and other essentials of life. Mourne Presbyterian Church has been involved with PHC in this work. Shortages of housing has made it difficult to recruit and keep staff at the hospital. Mourne Presbyterian Church has been involved in providing homes for staff. The HIV/AIDS epidemic in Sub Saharan Africa has devastated many families in Malawi. The hospital offers ARV treatment to minimise the effect that HIV has on individuals and communities. Nevertheless many children have been lost one or both parents. In response to this Mourne Presbyterian Church has provided homes for a number of families who would otherwise be destitute. All the homes provided for the community have been funded by a group (e.g. Youth Fellowship) or families from our fellowship. A new home under construction. The shelter where the family lived is in the foreground. In Bible times the people understood the value of water. Water supplies were sometimes a source of friction as different groups competed with each other for the right to use a well. Wells were also a place where people met socially and we know that Jesus used a well as an opportunity to share the good news about living water with a woman who had lost her way in life. “In rural Malawi the people still understand the value of a clean water supply but often do not have access to it. They have to settle instead for a polluted river or dirty waterhole which is used by animals. The result is poor health, especially in the children. Mourne Presbyterian Church has been working with The Primary Healthcare department of the David Gordon Memorial Hospital to provide clean water to villages and communities. Bore holes are used in areas where the water table is deep below the surface. A drilling rig is brought in and a bore hole is drilled and lined. A typical borehole would be 100 metres deep. The cost depends on the depth of the borehole but a typical price would be £5000 – £6000. Up to 2011 Mourne Presbyterian Church has provided 25 shallow wells and 1 borehole for communities in the Livingstonia area. Most of these were provided by gifts from families and individuals. For many people in the developing world the most immediate daily challenge is providing food for their family. In rural Malawi it is possible to buy food from market stalls or roadside shops if the money is available but ultimately the answer must to enable people to grow their own food. There is an old Chinese proverb which says Give a man a fish and he eats for a day, teach a man to fish and he can feed himself for life? The same principle applies to agriculture. Many of the people are willing to work very hard to provide food for their families but often lack the expertise and funds to get started. Working with the David Gordon Memorial Hospital Primary Healthcare Department Mourne Presbyterian Church has been involved in funding farming projects where a group of families are provided with land, basic tools, seed, fertiliser and advice to enable them to be part of a successful farming enterprise. We have also been involved in restocking the hospital fish ponds and providing a maize mill for the remote community at Kotochi. With the use of irrigation apparently useless land can become a fruitful oasis providing up to three harvests each year. Not only are families fed but excess produce is sold for cash which can be used for clothes, houses, school fees, etc. Maize, cassava, nuts and coffee are among the crops that are produced. The visitor to rural Malawi will be amazed as they come across fields of green healthy crops in the midst of the dry dusty landscape. Left to its own devices it will produce little but with a little investment in water, seed, fertiliser and expertise it will feed families and give people hope for the future. The visitor to Malawi should not be surprised to hear the request from an anxious parent ‘Can you help with my childs school feesï¿½?’ Many Malawian parents believe that the best opportunity for their child to escape from poverty is to get a good education and while primary education is provided by the government, secondary education must be paid for. Mourne Presbyterian Church is involved in education at primary, secondary and higher levels in Malawi. As well as renovating the school building, desks were provided for the children and on-going support is given to supply basic educational materials. Each year we present the children in the senior year with a copy of the bible. We hope that they will bring this with them as they move on to another stage of their lives, whether it be to secondary school, employment or living in their village. Khota Primary school is a small rural school in the hills above Livingstonia. We were able to help the school because of funding received from Kilkeel High School. The new school classroom block with the school management and some of the children. Mourne Presbyterian Church operates a scholarship scheme in conjunction with the Synod Of Livingstonia (CCAP). The scheme seeks to assist students who would otherwise not be able to afford secondary or higher education by paying part or all of their school/university fees. Four of the students are shown below. Unfortunately a university degree or a trade qualification does not guarantee employment but it does give these young people a better chance in life. We find it hard to imagine a church where even the elders do not have a copy of the scriptures and yet this is the case in many of the church groups in Malawi. Over theyears we have made available many hundreds of copies of the bible both in Tumbuka and English. When the news spreads that visitors have bibles to distribute people will walk for many miles to ask for a copy. Each year we present the senior pupils in Livingstonia Primary School with a personal copy of the bible. Bible distribution has been carried out through Primary Healthcare, the church, schools and the SCOM chaplain. When Dr Laws founded the Livingstonia Mission his vision was that it might become a centre of excellence in education, preparing young men and women for leadership of the nation of Malawi. Today the mission has a nursery school, a primary school, a secondary school, a technical college and a campus of the University of Livingstonia. In response to the opportunity presented by the presence of so many students, Mourne Presbyterian Church in partnership with the Students Christian Organisation of Malawi (SCOM) employs a chaplain to work with the students. The duty of the chaplain is to evangelise and teach the students in the scriptures and to give support and counselling when required. For more information about the Students Christian Organisation of Malawi, click here. The present chaplain is Mr Austin Chirwa. The church at Livingstonia is very much at the heart of the community. The pastor of the church is also the Head of Station with overall responsibility for the running of the mission station. The church is built in the style of a Scottish Presbyterian church, not surprising as it dates from the time of Dr Laws. As well as being the pastor of the Livingstonia congregation the minister is also responsible for a number of rural prayer houses in the surrounding district. The present pastor is the Rev Stephen Bota. This section is designed to provide the latest news about our partnership with the Livingstonia Mission and to provide topics for prayer. Johnny, Lyn, Cody & Suni Dowds are now in Livingstonia. Please pray for Johnny as he home schools the children and for Lyn as she comes to terms with her duties as a doctor. Remember all the management and staff as they prepare for the centenary celebrations on 21st & 22nd October. Continue to pray for Una Brownlie, the PCI missionary/nurse at DGMH. Civil unrest is a possibility as the people of Malawi protest about prices, fuel shortages etc. Please pray for a peaceful and just outcome. Pray for the DGMH hospital staff as they struggle with fuel shortages. Saulos Nkhata, our SCOM chaplain is ill at present. Please pray for him. Remember the many students in Malawi who struggle to pay fees.